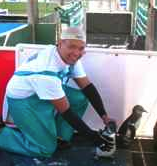 After all his daily chores of taking care of abandoned chicks, Paul answered your questions about African penguins! He joined us from the SANCCOB bird rescue facility in Cape Town, South Africa. Here's the video from that chat. There are also a couple ways you can ask questions.